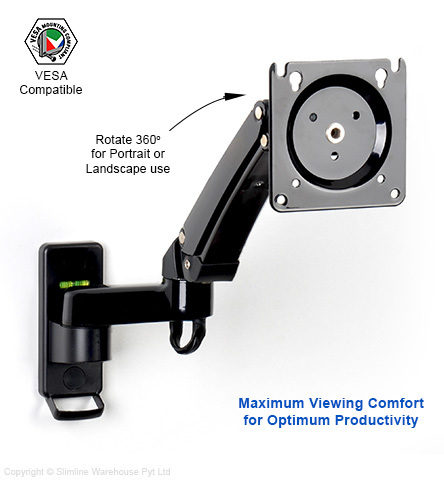 Using this articulating monitor bracket, LCD wall mount arm make it easy to install a monitor at your work or flat screen television in your home, restaurant, bar, or cafe. The versatile display can hold a range of television sizes from 30" to 40" that weigh up to 10kg. 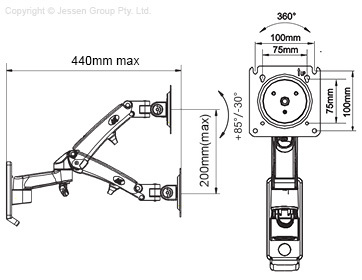 The VESA compatible bracket works with hole patterns between 75 x 75mm and 200 x 200mm. Included hardware has screws, spacers, and washers to easily attach your computer monitor or TV. An LCD wall mount arm makes it easy to position the screen for best view using articulating arms and a tilting bracket. The swivel and tilt mounts have 360° of rotation to hold easily change the screen between portrait and landscape orientation. This bracket is able to tilt the screen as well between +10° and -5°. The articulating arms move the screen using gas pistons within each arm, making changes effortless whilst also keeping the screen in position. Each arm also features a plastic clip to help keep wires in place for a clean look. This monitor bracket is made from aluminium for long-lasting use, with a black finish that looks great in all locations. A hardware kit is included for installation onto most wall types, with a professional consultation recommended if you are unsure if the included components are appropriate. This product despatches same day Australia-wide when purchased by 2pm EST, order today!